The UK food industry is home to some of the best high standard dog food brands in the world. They produce all quality food items those are biologically appropriate for a dog’s diet. These foods provide our furry friends excellent health, healthy teeth & nails, shiny coats, and great positive energy level. Here we have listed ten of the best dog food UK options have been giving Great Britain’s dogs for decades. We believe our detailed product review and helpful buying guide will support you to choose the right one. 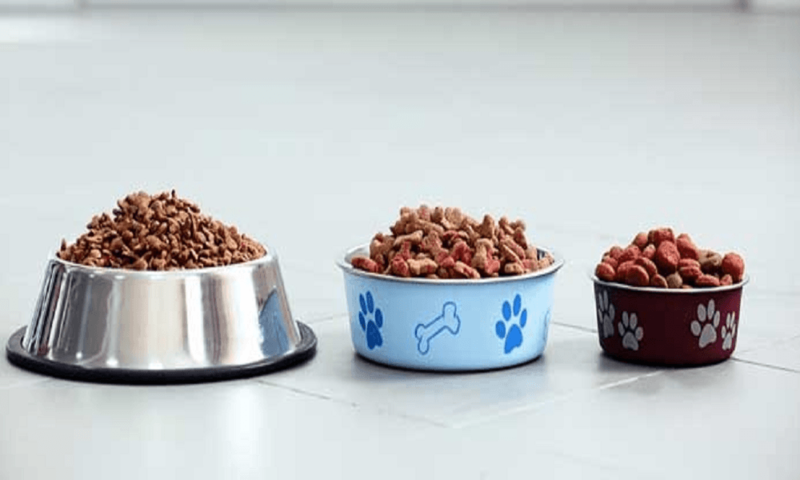 3 How to Buy the Best UK Dog Food? 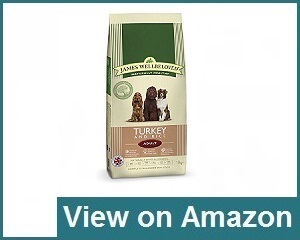 James Wellbeloved 15-KG pack is very popular in the UK as the number one dog food for its special taste and nutritional value. Here the main used ingredients are brown rice, oats and turkey meat made the food more delicious to eat and easier to digest. These are also hypo-allergenic, helps to eliminate possible allergic reactions from meat, dairy, wheat, eggs, and gluten. There are no additives, cheap bulking ingredients, appetizers or artificial flavors. It is full with the high level of anti-oxidant, essential vitamins and minerals enhance your dog’s proper growth and good health. Included rich source of fatty acid also helps to grow healthy and glossy dog coat. This well-balanced diet recipe encourages beneficial intestinal bacteria inside the dog’s body to improve digestion capacity and absorb the highest nourishment from food. The food formula also contains white meat goodness of turkey with wholesome brown rice those are ideal for the sensitive stomach. This best-rated quality food is available in another smaller size so that you can collect the suitable one regarding your dog size. With other usefulness, this food releases dogs from poor digestion, improper stool, and various digestive problems. 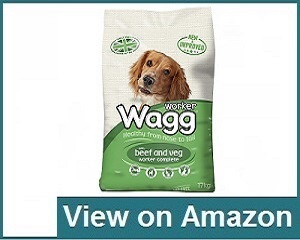 Wagg working food is a balanced formulation with Veg and Beef supports to keep your dog stronger and active. It is full of healthy ingredients like meat, citrus, yucca extracts, vegetables, cereals, minerals, fats, and oils supply proper nourishment and maintain the average energy level. This UK food contains carbohydrate, vitamin A, B, C, and E to support the immune system and adequate vitamins and minerals for proper body structure. The balanced amount of zinc, omega 6 & omega 3 fatty acids dedicated to grow your dog’s glossy coat and healthy skin. The special fiber ingredients enhance digestion capacity. There is no artificial flavor, color or harmful ingredients used to increase the test of the food. Even, considering the health of the pet, no sugar has been added to the food and used colors are also collected from the mineral sources. 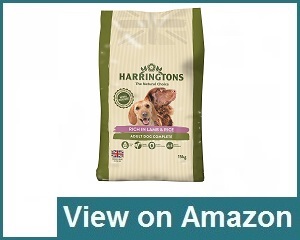 Harrington’s dry dog food occupied the #1 bestseller position for a long time. Every pack of Harrington’s food contains 20% of protein, 10% of fat, 3% of fiber and it does not contain any wheat, soy, sugar, and artificial color and flavor. The basic food ingredients are meat, rice, linseed, yucca, and yeast but may differ for some cases like Turkey & Vegetables and Lamb but you can refer this food for regular feeding to your dog. Compare with other ingredients list, Harrington ensures a proper mixture of lamb and dry mix and dogs become happier and healthier to get it. 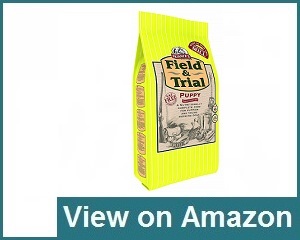 The 15kg bag is a little bit expensive but dog owners become highly satisfied to offer it to their dogs. It provides total nourishment for growing and young dogs and helps to grow healthy skin, shiny hair, proper digestion, perfect stools and appropriate weight to your dog. It also works as an alternative of hypoallergenic food for dogs. 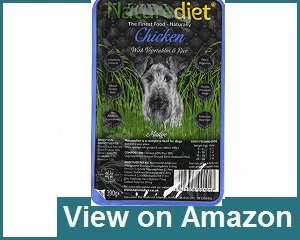 Naturediet is a complete natural dog food made by 60% chicken, 5% brown rice, 5% vegetable, herbs, ground bone, and kelp. It also contains omega 3 & omega 6 fats for shiny skin and coat and avoids additives, color changer, ingredients, preservatives, and chemicals when preparing. So, it is naturally healthy, hypoallergenic and perfect as sensitive stomach food. Pet proprietors feel relax to feed this food and after a certain period of feeding dogs become improve from dry issues and flaking skin. Dog owners reviewed that, their dog’s stools became soft and skin became shiny for using this natural diet for a short period of time. The chicken treat makes your dog excited at meal time. 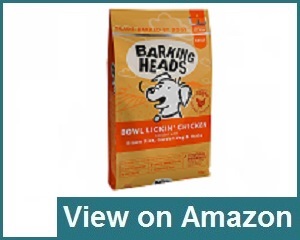 It is an outstanding food for dogs who love to eat wet food. Some pet lovers mix this food with dry foos to make the meal more delicious. It ensures a different diet for senior dogs, adult, and puppies. Actually, this UK food is relevant for any ages and sizes dog. Royal Canin UK maintains your dog’s normal defenses to promote a beneficial intestinal flora, zinc, vitamin A, biotin, Omega 3 fatty acids and helps to regenerate their hair on the skin. This top-rated food also contains vitamin C and E to sustain cell vitality. It enhances your dog’s immune system and maintains an ideal weight. A proper balance of dietary fiber and high-quality protein of this food ensures healthy digestion of food. The main ingredients of this food are animal fats, animal protein, dehydrated poultry meat, wheat flour, fish, soy oils, beet, egg powder, minerals, and yeast. There are no artificial color, flavor or harmful chemicals included; even this food fascinates dogs for its special size, shape, and texture. Dog owners are happy to observe their dog’s interest in this food. 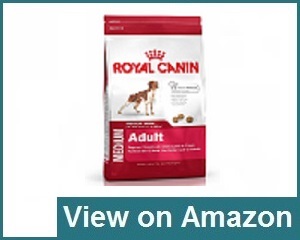 Many pet proprietors regularly collect this food for their pet’s proper nutrition and some new buyer also shift into this Royal Canin Food to show the excellent health benefits in their dogs. 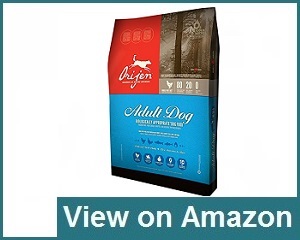 This food is specially formulated for a medium and adult dog breed. It is prepared regarding the dog’s size, age, and breed. Your dog becomes healthier, energetic and stronger to eat this food regularly. It is so much palatable and highly digestible, that’s why your dog always keeps safe from the digestive problem and finally dog owners love to purchase this great food to make their dogs more healthy and happy. Renowned as best grain free food and contains chicken, turkey, eggs and wild caught fish as the main ingredients. It offers a proper diet for fully-grown dogs of all dog breeds. These are different from other pet foods contain a high level of protein from fresh meat, healthy fruits, and vegetables but few amounts of carbohydrates and no cereals. The chicken is easily digestible provides a sufficient amount of protein and fats, turkey provides natural vitamin B3 and necessary amino acids. The fish is the main source of omega-3 fatty acids help to grow healthy skin and a shiny coat. Mainly, Orijen food brand is made in Alberta, Canada from fresh Canadian ingredients maintain a new concept of pet nutrition and produce biologically appropriate food. Mainly, Orijen food brand produce food products from fresh Canadian ingredients. They maintain a new concept of pet nutrition and consider your dog’s biological demand through their food formula. A complete natural dry food for adult dogs formulated with chicken, brown rice and peas. It is deliciously tasty can enjoy all dogs and get adequate nutrition. It is effective for sensitive stomach, loose stools or flatulence and proper cure of gastrointestinal upsets with unhealthy skin and coat. There is no synthetic color, flavor or preservatives and you can feel free to collect this item to make your dog happy and healthy. 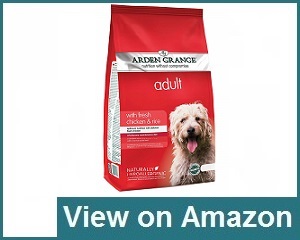 A super quality, highly digestible and extremely palatable food is special for adult dogs. It is formulated with fresh chicken, maize, refined chicken oil, beet pulp, dried egg and does not include any artificial colors, flavors or preservatives. It contains a balanced blend of nutrients and natural supplements to promote optimum health, energy, and fitness of your pet. The high proportion of chicken (32%) is the prime source of quality protein, very much essential to meet the structural and functional demands of your dog’s body. For instance, used chicken oil is the basic source of fat which is easily digested and most suitable for dogs have the gastrointestinal problem. It is special for puppies and young working dogs to meet the nutritional demands during their most critical stages of progress. The main ingredients are meat, rice, wheat, soy, barley, maize, oats, glucosamine, and chondroitin. It is also helpful for proper digestion and maintains a healthy immune system. This food is totally gluten-free and ensures a sufficient amount of proteins, carbohydrates, vitamins, minerals, and oils for healthy growth. 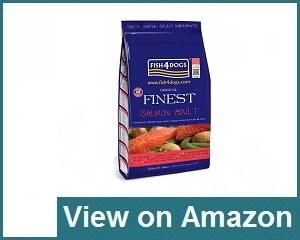 This food is mainly formulated with highly palatable salmon fish. It is the prime source of omega 3 fat ideal for healthy coat & skin and joint movement. The omega 3 also reduces dry and irritated skin from the dog’s body. It is easily digestible and good for the sensitive stomach. Potato and peas are another ingredients supply necessary carbohydrates. How to Buy the Best UK Dog Food? By considering above factors, your professional vet will be able to guide you what should be perfect for your own dogs. They also capable to recommend some decent food brands that you will find from cheap dog food UK, best-wet food UK, puppy food, dry food, or senior food list. Not all foods are equally formulated and not contain the same level of nutritional value. There is also a different dietary requirement arises at the different stage of the dog’s life. So, it is better to take the regular suggestion from the vet about your dog’s proper nutritional health. Moreover, here we have highlighted some essential factors you should know before purchasing any food item for the dog. Considering food nutrition, experts divided the dog’s life into three stages: puppy, adult, and senior. In these three stages, they need a different combination of nutrients and minerals. Puppies have not adult teeth and they need smaller chunks of kibble those are filled with nutrients to maintain their growing health. For senior dogs, it should serve essential oils and calcium to with each meal to support their joints and bone in old age. But in adult age, you should make a combination of these two foods and offer them to sustain good health. Health is another vital factor for pets and you should always observe the overall health condition to determine whether it should provide more special diet or not. Remember, overweight also harmful like underweight. So, feed them sincerely and try to maintain a balanced nutrition during each meal. In this article, we have recommended several food items those are ideal for your dog’s proper health. It is the precondition of healthy dog foods. Natural food means it has not anything which is non-organic or genetically modified. All sorts of vegetables must be used in a natural way and meat must collect from a genuine source. Always avoid meat meals including head, horns, feet, hooves and so on. Meat should be used only from the muscle part. Always choose grain free foods, because grains are full of carbohydrates provide energy but not enough nutrition. Wheat and corn are the real sources of grain also trigger allergies in the dog’s body. You have to sincerely avoid all artificial colors, flavors and preservatives may cause various skin disease, digestive problems, diabetes or other similar health problems. Budget is another issue has a great effect on food brands. You know, quality food brands are expensive and you have to compromise with the budget to collect them also these are very much useful for dog’s health in many ways. There are also some less expensive food brands providing better nutrition but you have to find out them and offer your dog to check the real benefit. On above we have listed some cheap rated UK foods those are full of proper nutrition and good for dog’s health. There are some common food items available in the market are completely injurious to dog’s health. Here is a list of some common deleterious food items that you’ll need to protect your dog from. Some dogs can’t tolerate dairy foods and may cause of vomiting or diarrhea due to an upset stomach. In this case, you should strongly avoid these milk products for such reaction of the dog. Normally, some breeds like to get chocolate as the special treat and loves the smell. It generates toxic in their stomach and always be sincere to provide them as low as possible to feed. Some fruits are full with citric acids like lemon, grapefruit, orange and so on may cause of serious vomiting and diarrhea. These interrupt normal digestive system and may fall your dog into the bad depression. Some foods come with high-fat ingredients and loyal to your dog’s overweight. Fatty foods also may cause of high blood pressure and the dog fall into suddenly sick. You should sincerely avoid these foods to feed dogs like candy, gum, peanut butter, bacon, fatty meat etc. Salt is indispensable for the regular diet, it helps to accelerate muscle and nerve functions. Salty foods are harmful to dogs which have kidney, heart or liver problems. To tackle these chronic diseases you may need to watch their salt consumption regularly or getting advice from your vet to ensure their healthy diet. There are some feeding tips may help you to take care of your dog properly. If you feel trouble to feed meal in one go, you can offer it in several times. Don’t impose the amount recommended by food manufacturers. Softer stools are the classic sign of overfeeding. It is not a good practice to change your dog’s diet suddenly. If it is needed, take help from your vet and try it for a few days or a week. Avoid feeding before traveling; your dog can become abruptly sick in the car. So, it would better if you feed him at least one hour in hand. Stomach dilation or bloat is life-threatening, so don’t provide food an hour before or after exercise to keep them healthy. Keep your dog calm while taking food and don’t let it eat aggressively. When you observe the dog is approaching politely during meal time, add some little amount as a reward. Help him to take rest for a while after the meal. Try to stick with one variety of good quality food to sustain the habit. Never encourage to feed your dog from the table or your own plate during meal time because this will make your dog aggressive or greedy. Moreover, you can do plenty of research, get advice from trustworthy sources or veterinarians, read out recent customer reviews and different publications on best UK dog food brands. Remember, a quality food brand meets your dog’s overall need and you can sustain it for a long time period. Question: How often should you feed your dog? Answer: Usually, it is needed to feed your dog two times each day at 8-12 hour intervals. Most of the time feeding suggestions are labeled on the food package in detail. Where is given the recommended amount of food a pooch needed to take per day regarding its weight. Moreover, try to follow your vet’s recommendation and make sure not to overfeed. Question: How much food should I provide my dog? Answer: According to Dr. Gary Richter notes, “Just as with humans, a highly active pet is going to require more calories and protein to maintain muscle mass and energy levels.” Your dog’s body shape, metabolism, and lifestyle also important consideration into how often and how much it should be fed. Question: Can I feed my dog all day long? Answer: Free feeding is not recommended in any way; 2-3 meals per day are highly suggested for average pet animals. But for special circumstances, it may require to provide meals more frequent, like for nursing puppies or a pregnant dog. Question: How do I list the best food items for my dog? Answer: Actually, you know well which food your dog like best. There are over 3000 formulas included in UK dog food brands and you can select the desired one by checking the ingredients list over the package or getting suggestions from your vet. Question: What is the right amount should I feed my dog? Answer: Feeding the right food is just as important as feeding the right amount. Primarily you should follow the feeding guideline on the packaging. Your vet will also able to suggest the food type and amount of food considering your dog’s overall situation. When your dog’s food choice centralized on one food, you should conscious about feeding amount to control overweight. Consider your vet’s suggestion and try to follow at feeding time. If the dog belongs in underweight try to increase the feeding amounts by 10% or switch into a higher calorie diet. Hello, This is a nice website, thank you for the detailed recipe for the thorough write up.